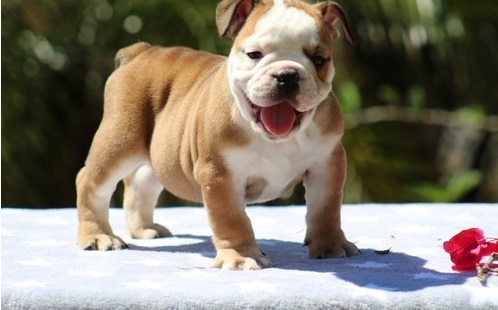 Description :We are proud to announce for sale a litter of beautiful, KC Reg bulldog puppies. Sire to the litter is 2017 Crufts winner, Ricatori Roman King. Roman is not only a very good looking, prime example of the breed but has undergone and passed a number of health tests. Dam to the litter is our girl, Bets. She is very loving, fit and agile and comes from a strong pedigree full of champions and Crufts winners. She has mostly Mellowmood and British Pride lines. We only have 1 boy and 2 girls available, These pups have been raised in a loving family home around young children and other dogs with no expense spared. Pups are ready to leave to their new homes and will leave with: KC 5 generation pedigree certificate 1st Vaccination Micro chipped Vet checked Wormed 4 weeks free insurance Food Bulldog book Lifetime of help and support To arrange a viewing or for any further information please get in touch. Our pups will be sold to the best homes, not to the 1st to offer money,get back to us with your number so that we can call you back if we missed your calls.